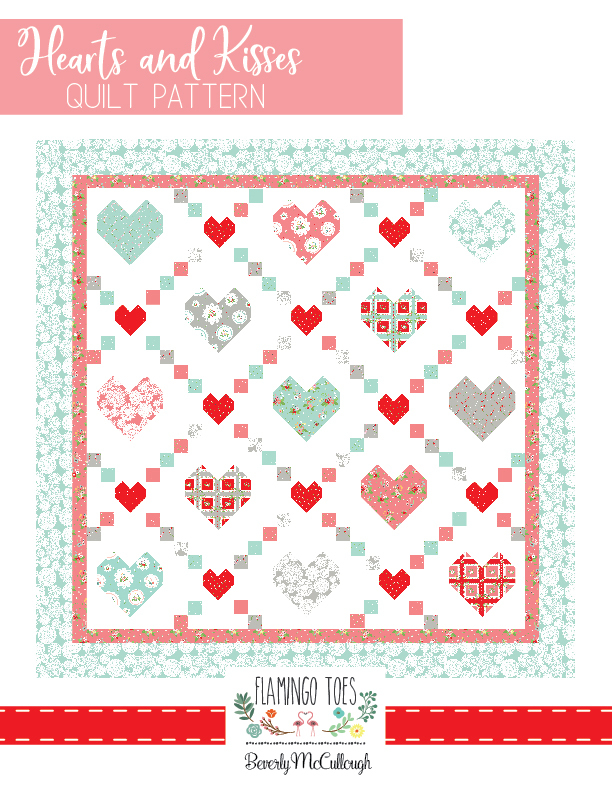 I’m so excited about today’s new quilt pattern! 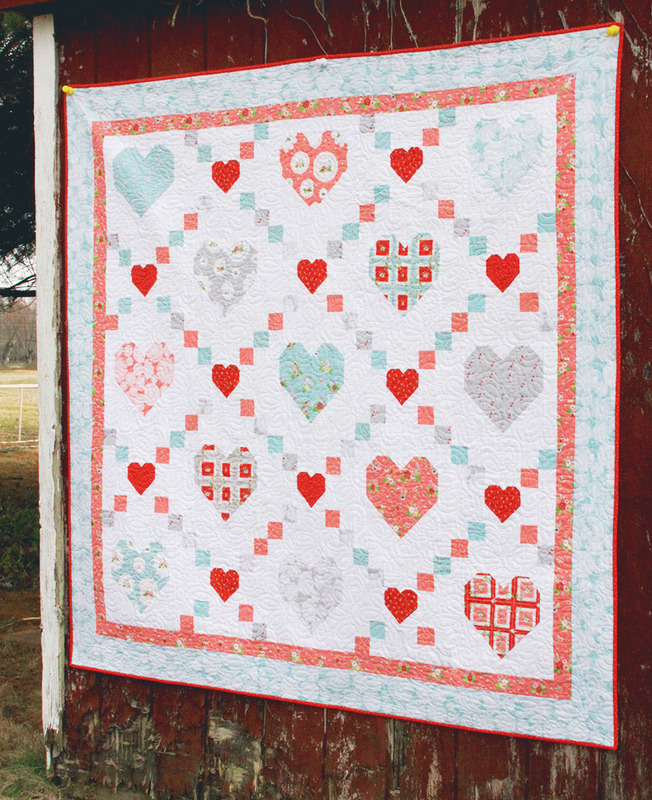 This Hearts and Kisses Vintage Keepsakes quilt pattern is so perfect for Valentine’s Day, but I love a heart quilt for any time of year! Especially one that’s super quick to sew up and precut friendly! 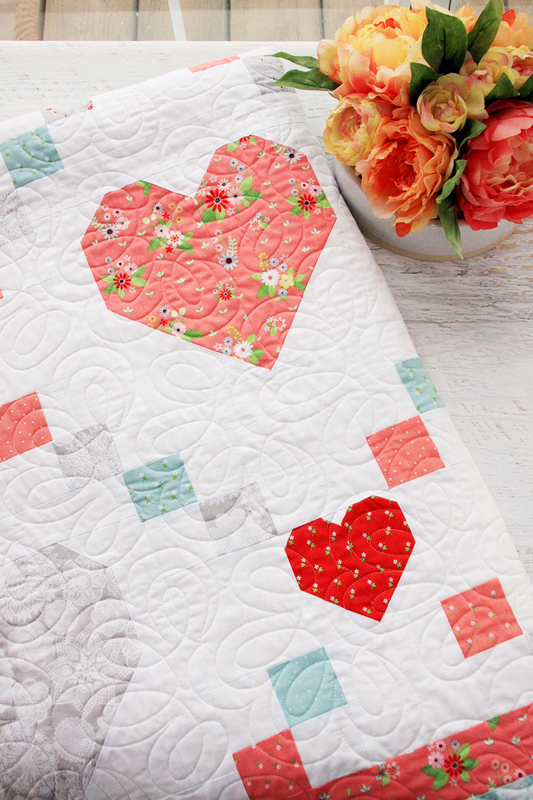 With all the hearts in Vintage Keepsakes – I thought it would be fun to create a quilt pattern (or two) to incorporate them! 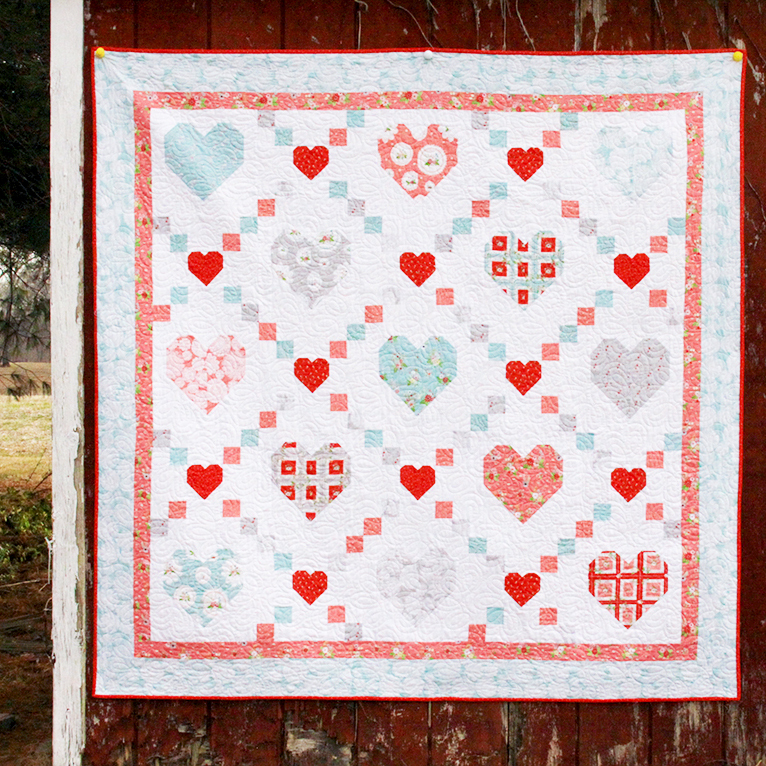 I love the big hearts in this to show off those large scale fabric prints, and the little kisses blocks are so fun to sew up with the little squares and small hearts. I used some of the white and red heart print for the back since we’re so close to Valentine’s Day but I think it would be so fun with the floral prints or one of the doily prints too! I used the little cross stitch print in red for the binding. I love that it has a scattered polka dot look to it!! 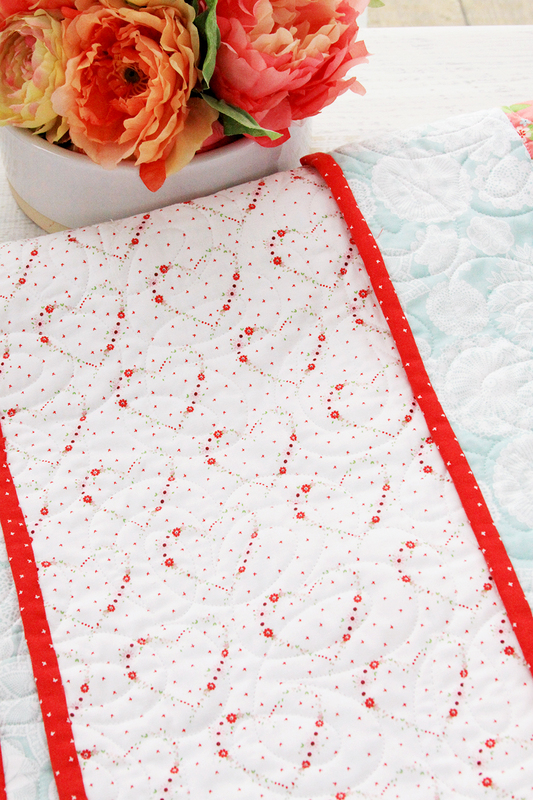 Also – I love how the handkerchief print looks in the heart! Since you’re using a 10″ stacker to make the large hearts, it is so easy to match up those details for an almost seamless look. This quilt is all pieces with Aurifil 50wt white – I just love working with it. And all my quilting was done by the fabulous Julie Williams quilting. She is local to me but you can ship quilts to her as well – I highly recommend her!! I love how those swoopy swirls look in all the white on this quilt. I have this quilt pattern in both Paper and PDF versions in the shop so you can pick whichever works best for you! So absolutely darling! Beautiful design. Love! Another great design for large scale or favorite fabrics that don’t want to be cut into small bits. It could be any theme for anyone’s favorite pastime! I see it with music, cycling, camping, road trip, flowers, sewing or quilting, photography etc. Just ‘cause it’s hearts doesn’t mean it has to be pink or red, right? That is adorable! I love it. I am kind of liking all things heart right now. I love tis. I have hearts through out my housematerial is so sweet. . 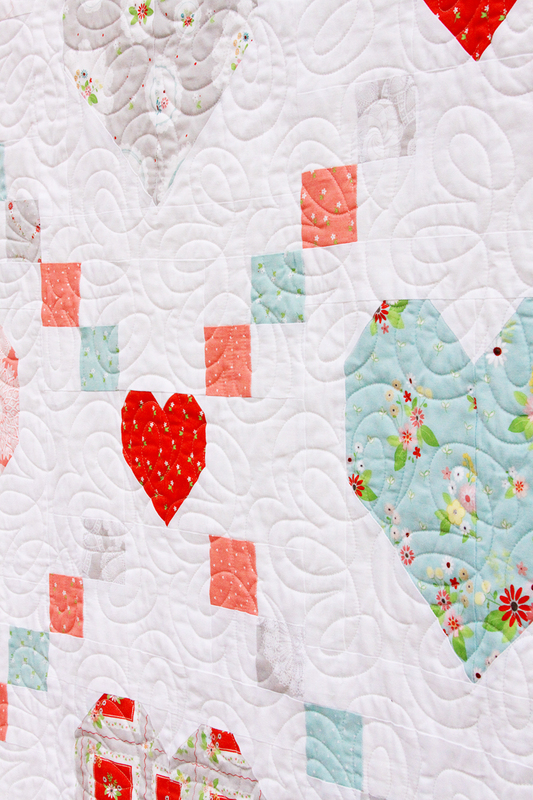 The hearts and kisses quilt is so adorable. I recently shared some pictures in the Facebook group of heart projects I was working on. 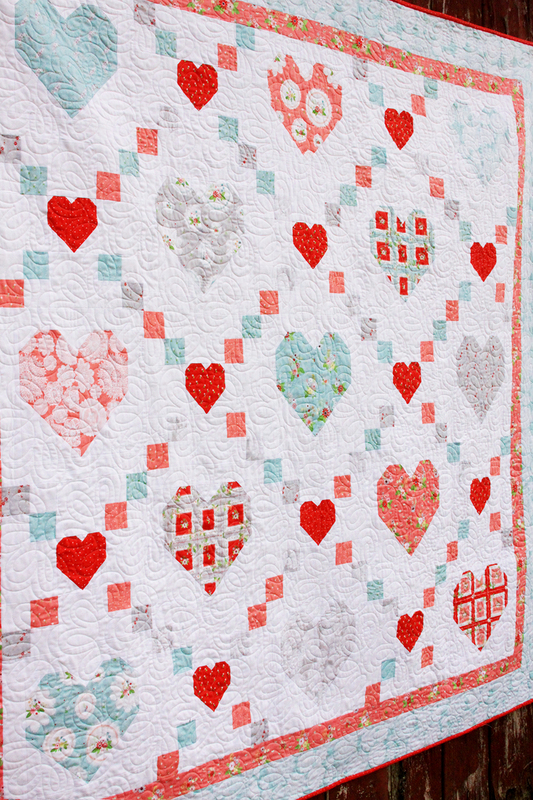 I love hearts and I especially love reds, pinks, aquas/turquoise shades together. The seem to coordinate so well. I would love to work this pattern up. 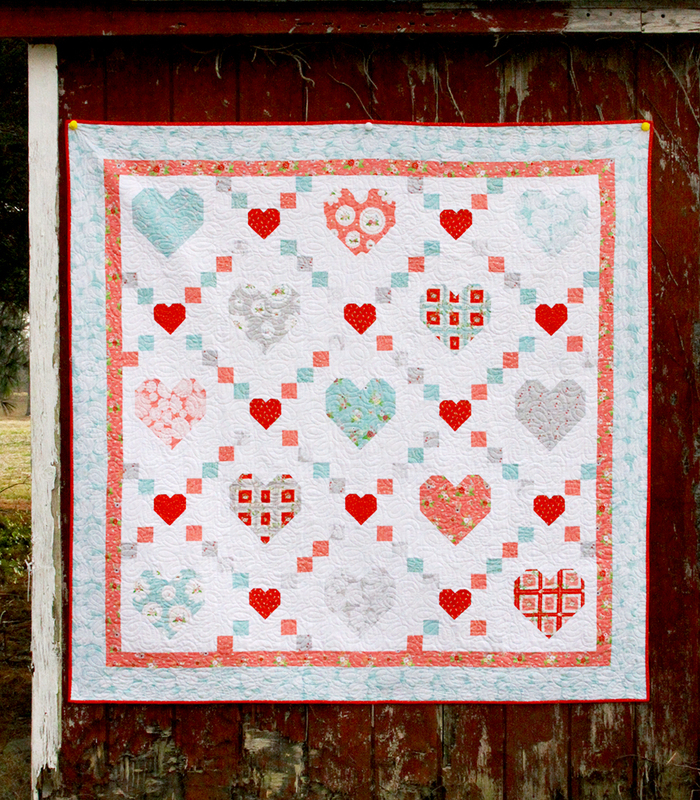 I love to make heart quilts to send to the hospital…this one will be perfect made just a bit smaller to accommodate their needs. I’m always looking for new patterns to give me a little variety at the machine! Thanks for what looks to be a really good option! So Sweet!! Love this pattern!! I love your use of all these fabrics and the many designs you have come up with. This fabric series is simply scrumptious! This is just gorgeous with the cute smaller heart blocks in between. Love this pattern! Adorable! So pretty. Great pattern! 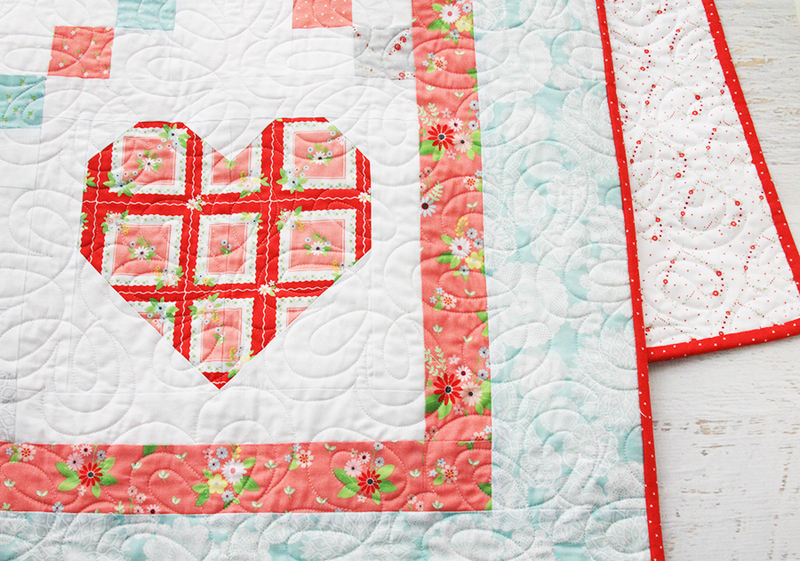 Oh my gosh, this quilt is so adorable! I want to make one right now. Lovely pattern! I love everything about this, the fabrics, the pattern and the quilting! Thanks for wonderful time with you at Missouri Star Retreat! I bought this kit there and is being shipped to me. I can’t wait till it gets here!